Research data management involves the active management and appraisal of data over the lifecycle of academic and research interest. By following a simple framework to manage your data you can ensure that you and your collaborators can exploit their full potential. Appropriate planning at an early stage in the research project will ensure you are not in breach of any requirements from your funders; have sufficient storage for a specific period; identify and obtain the right amount of support where you need it. 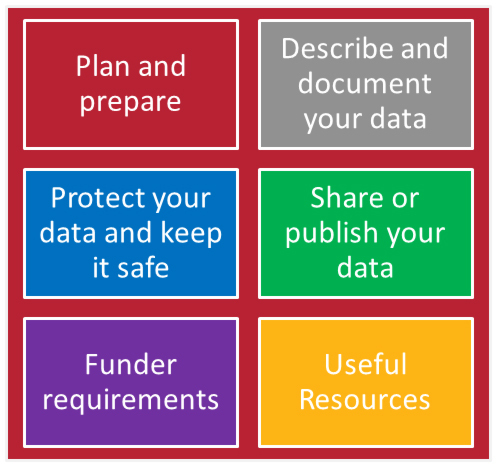 Find out more about what you need to do to meet the University's expectations for research data management by accessing the University policy here. Click on a section in the diagram below to find out more. Contact rdm@bangor.ac.uk for further information and support. *If you are funded by EPSRC or ESRC the requirements have recently been updated (April/May, 2015). Find out more in the 'Funder requirements' section below. This site is based on the sites at the University of Huddersfield & University of Leicester.